The handbook was written and compiled by Howard Sutherland, Ed Colaianni, and John Allen. It contains troubleshooting and rebuilding information, comparative parts lists and lovely exploded diagrams of a large amount of hubs produced between 1960 and 1992 including Sachs, Sturmey-Archer and Shimano hubs. 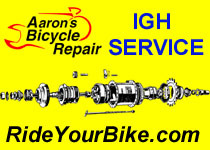 This is definitely worth checking out and bookmarking if you’re an IGH fan and tinkerer.